We were happy to finishing digging potatoes this week. It was a beautiful fall evening to do this! It is hard to believe that this growing season is almost behind us. Like every growing season, there have been so many opportunities and challenges during the season. 1. Getting to know all of you better. We truly enjoy this opportunity to have great conversations and laughs with all of you while providing some garden joys for you and your families. 2. Working together as a family. While this can be challenging at times, it truly provides great opportunities of spending time together, learning together and accomplishing many things together. 3. Bringing science to life. When you see science in action it provides awesome hands on learning experiences difficult to replicate. Every challenge presents an opportunity for learning, and we have learned a lot and have plans for improvement next growing season. It is always interesting to discuss these challenges as a family. I am always amazed by our kids’ ingenuity and insightful thinking to provide a workable solution. 1. Peppers – Interesting year of growing peppers. Our bell peppers did not produce as much as they have in the past. We feel the weather simply wasn’t conducive for this vegetable. The new varieties of peppers that we planted are just coming into production now – interesting how the seeds were planted in March and production has just begun on those. 2. Pumpkin/Gourds – A variety of molds set in on the leaves – which killed the leaves and stopped the plant from growing. We also had squash bugs that loved to eat the pumpkins and gourds. We learned a valuable lesson on seed saving and what is frustrating to both of us is we should have both thought of this! We saved pumpkin seeds from last year’s white pumpkins which were a hybrid pumpkins A hybrid is created when plant breeders intentionally cross-pollinate two different varieties or species (ex. two different types of pumpkins), aiming to produce an offspring (hybrid) containing the best traits of the two parents. While we knew saving the seeds and planting them would be an experiment and one we could all learn from – the valuable lesson was as follows. Not every plant’s seeds are worth keeping. Hybrids are wonderful plants, but the seed is often sterile or does not reproduce true to the parent plant. Therefore, never save the seed from hybrids. 3. Replanting – lettuce, flowers, cabbage and garlic. Throughout the growing season, we continue to plant new crops of the vegetables to keep you supplied, and fresh veggies growing throughout the year. That is if Mother Nature cooperates. We went from a cool, wet June (in fact the wettest June in Minnesota history) to a very dry few weeks in July. I planted a few different crops of lettuces and flowers in July and had no luck of them growing due to the lack of rain. It didn’t matter if I irrigated. Nothing grew. As soon as we had some rain (about four weeks after I had planted), the lettuce seeds I had planted grew. The flowers on the other hand were delayed immensely and never produced. I planted garlic this spring – no luck – no growth. I am going to attempt to plant some this fall with the hope that we will have garlic this spring. 4. Insects – I mentioned the squash bugs earlier, and we have discussed the potato bugs on previous blogs. To control these insects, we are discussing additional flowers to plant in order to generate more beneficial insects, as well as other options for crop rotation that may help to get rid of these nemesis. Fall Clean-up has began. Check it out. It doesn’t look the same out there. The boys have been fantastic help. Putting in long days to accomplish the tasks. They are good workers! Clean-up has begun preparing for the cold weather to set in. Some of the plants have been shredded, and the green mulch has been pulled. Above, Keith and Steve are rolling up the irrigation tubing for winter storage. So what has been eating the potatoes. We think it may be voles. Don’t worry these potatoes were recycled as chicken feed! Reminder – This is the last week of the CSA boxes. This is a bonus box due to the interesting growing season. Thank you all for being shareholders this growing season. Boxes and supplies can be returned at any time or in a few weeks when we connect about the red, white and blue popcorn. 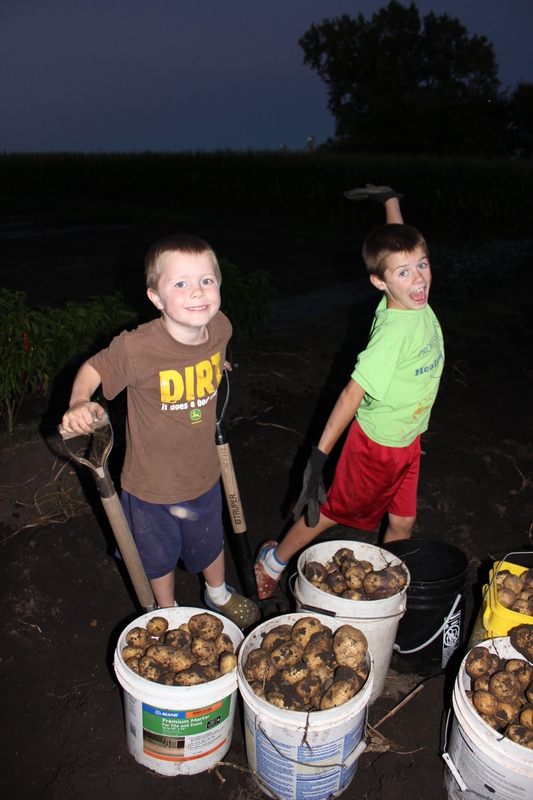 This is how the boys feel when we are done harvesting one of the crops: excited, proud and relieved. Thank you all for a great season! We appreciate your trust and the opportunity to work with all of you! Carrots – Enjoy these fresh carrots! Broccoli – I enjoy broccoli on my salads or I cook them on the grill and melt some sharp cheddar cheese over it. Peppers – Jalapeno peppers and Bell Peppers – remember to cut these up and freeze them so you can use throughout the winter. Tomatoes – Baby Boomer cherry tomatoes, Big Mamma, Sunny Boy (yellow), Honey Delight (small yellow) and Fourth of July (medium red) and cherry tomatoes. Do you have to many? Try freezing them by simply cutting out the core, slicing them into quarters and place in a Ziploc bag for soups and chilli this winter. Onions – No onions in the box this week, but I wanted to remind you that you can also preserve the onions by cutting them up and freezing them. It makes cooking a breeze when you don’t have that mess to clean up when a Tablespoon of onion is called for. It’s a lot easier to reach in the freezer and grab some frozen onions for the recipe. Sam is holding the potato plant. Potatoes grow under the ground and are a tuber. Sometimes when you pull up the dead plant the potatoes come out attached to the plant like you see here. Potatoes – Red Pontiac – the link is to more potato basics and recipe ideas. Masquarde Potatoes – A tasty potato that everyone in our house is excited to eat. These potatoes can be cooked or baked. I have had luck using this potato in many ways. It is very versatile. Kennebec potatoes – great for baked potatoes. Butternut Squash – Freeze your leftovers in a cupcake tin and store in a ziplock bag or container. Use throughout the year as your “pumpkin” in your recipes. Spaghetti Squash – I have frozen this squash as well. Cook it up, take it out of the “shell” by using your fork to make it like spaghetti and freeze in portions that your family will use or that a recipe will call for. When thawing, I simply placed the frozen spaghetti squash in boiling water for a few minutes (just enough to thaw), and I was all set to go. Carnival Squash – This squash has a nutty mild flavor and reminds me of an acorn squash. We have a variety of different colored egg shells because we have different breads of chickens. The brown shelled eggs are from Red Stars, green shells from Araucana and white shelled eggs from Leghorns. There is no nutritional difference, and the egg tastes is the same. Eggs – Enjoy – let us know if you would like any eggs in the future. The boys sell them for $3 per dozen. Sweet Corn – Thank you to FarGaze Farms for this partnership in growing the sweet corn. Enjoy! To freeze my corn, I simply cook it as if I were going to eat it, cut it off the cob, place it in a container and freeze. To me, it is about keeping it simple and easy. Fresh Arrangement – Hydrangea and Sedum – these can both be kept as fresh arrangements or dry arrangements. To dry – simply put in a vase with no water – enjoy for the remainder of the fall. A Minnesota favorite…I once had a Minnesotan who was born in California tell me, “I don’t know why you Minnesotans waste perfectly good tater tots on a hotdish.” This is a family favorite and an easy way to use many of your fresh or frozen vegetables. Brown 1 pound of hamburger and about 1 Tablespoon onion. I have also used venison. I am fortunate to have beef from my parents farm that we use. This can be browned over the stove or in the microwave. Add a can of Cream of Mushroom/Cream of Chicken soup – I like using a blend. Add about 1 1/2 cups of vegetables. I used corn, green beans and peas. Mix all of this together with the hamburger. Top with frozen tater tots. Place in the oven and cook at 350 degrees F for 1/2 hour or until edges are bubbling. Check out this link for the recipe and photos to make this delicious bread. A family favorite is potato bread. It really is quite simple and unbelievable moist. I served these buns with the hotdish along with some fresh melon from last week. This entry was posted in Uncategorized and tagged butternut squash, buying local, CSA, factory farms, family farms, farming, food, Gardening, gardening with kids, kids in the garden, local foods, Northfield, vegetables. Bookmark the permalink. We had garden trouble with too much rain and cool temperature too. The weather really does keep gardening interesting! Looks like you had some nice variety your garden as well. Good luck with the garden wrap-up.